EDIT: The updated game is available at wolflore.net . Please let me know if you download it and what you think. Unless I hear from somebody I'll assume nobody has downloaded it. I make these games as a free advertisement for the commercially released Vera Blanc games (and for my own enjoyment). This is a fan made game based on the Vera Blanc and Brandon Mackey characters, created by winterwolves games (characters used with permission). Take on the role of Vera Blanc, a beautiful young woman with the extraordinary ability to read other people's minds! Daughter of multi-millionaire Emmanuel Blanc, Vera left her life of luxury to work alongside paranormal detective Brandon Mackey. Be immersed in the world of the supernatural as you play the detective! In this game Vera Blanc and her partner Brandon Mackey investigate a 'missing person' case. Was he killed by a ghost? Will you be able to solve the mystery? The game ending you get depends on choices you make. Game play includes a challenging mini-game. Time period for the game is after the two commercially released Vera Blanc games, and also after 'Island Phantom' and 'Carpathian Horror', my two fan made Vera Blanc games. 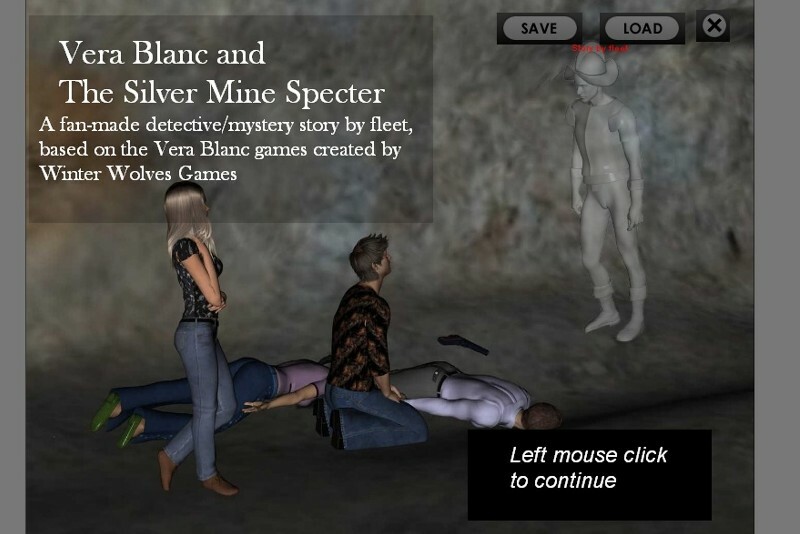 A big thank you to jack for granting me permission to use the Vera Blanc characters in another fan-made game,tentative title: "Vera Blanc and the Silver Mine Specter"
Last edited by fleetp on Thu Aug 08, 2013 4:00 pm, edited 8 times in total. Update. Beta is version is ready for testing. The game is now available for download. See first post for link, screen shot and additional information. This is the 'teen' (ages 13+) version.
. I've updated the game. If you have played the older version and have saved an in-progress game, I suggest you restart the game when you use the updated version. Last edited by fleetp on Mon Sep 09, 2013 5:43 pm, edited 1 time in total. Minor bug (free pass for mind reading game) has been fixed. I've updated the link in the first post. I've re-made this game with new graphics and added an ending. I converted the 'adults only' version to HTML format using techniques developed by kexter; the visual novel is now playable on MAC, Linux, and Windows systems using a web browser that supports HTML 5. The download is in the adult game section of wolflore dot net (free registration is required to access the adult area).